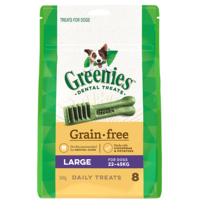 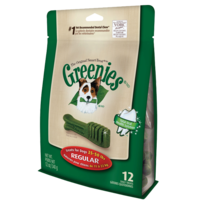 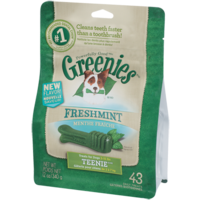 Greenies dental chews for dogs are the perfect way to clean your dog's teeth, freshen their breath and reward them at the same time! 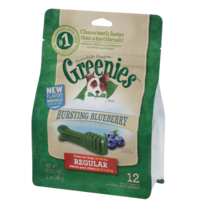 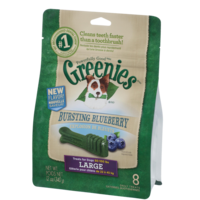 Greenies Dog Treats come in 3 flavours; Original, Freshmint and Blueberry. 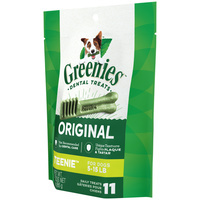 They have four different sized toothbrush styled treats; Teenie, Petite, Regular and Large. 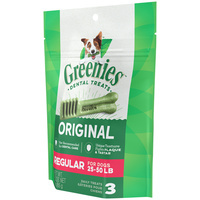 How many Greenies can my dog have each day? You can give your dog 1 per day. How old does my puppy need to be before I can give him Greenies? Puppies can start having Greenies from 6 months of age. It is also not recommend giving them to dogs under 2kgs. 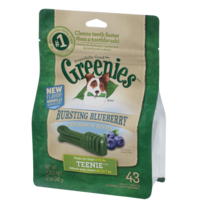 What flavour is the most popular? 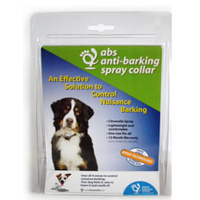 We find that the Original is the best seller for us, however it will vary on dog to dog.